Portable load bank cannon L29. Condition is New. Shipped with USPS Priority Mail. Condition is Used. Load Step - 1,2,2,2,3 KW. Condition is Used. MODEL L-42-350 PORTABLE LOAD BANK. The L-42-350 LOAD BANK is designed. to provide a temporary load for field. The load can be adjusted from 0-400. 10FT Cable for connecting load bank to power source. Portable Load Bank Cannon L-48-350 With Lead Cables. 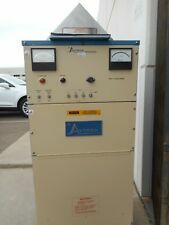 Portable Load Bank, Cannon L-48-350 Commonly used for load bank testing of airport Ground Power Units 48 VDC, 350A Lead Cables ARE included. Carrying case is not included. Condition is Gently Used. Great working condition. The ASCO Avtron 2300 (SLS-10) Load Bank is a self-contained, rack-mounted server load simulator designed for simulated heat loading of computer server up to 10 kW. SIMPLEX TITAN LOAD BANK. LOCATED IN ANDERSON CA, ZIP 96007. 2 UNITS AVAILABLE // PRICE IS PER EACH. FORCED AIR COOLING. This is a Simplex Air-Cooled Resistive load bank - LBS series. CRLS 11.5 kW at full load Data-centers are built to maintain a 2N (A/B) utility grid redundancy and the CRLS load bank was designed to facilitate that network design. The current draw is 2.6 amperes at 120VAC with the fan at its maximum setting (internal or external power). 4kW (4,000 Watts). TDI Power Load Bank. Model: K571. Make: Avtron. 40Kw 280VDC. NEW SURPLUS WITHOUT BOX. UNITS TOP PANEL HAS A SLIGHT INDENTION AT ONE OF THE HANDLES, THIS IS SHOWN IN PICTURES. Be sure to see our full inventory of Rosemount, MicroMotion, Yokogawa, Allen-Bradley, Endress Hauser, etc. 6.0MVA Crestchic Load Bank. S/N: C3496. Resistive/Reactive Load Bank. Weight: 36376 lbs. 380-480V, 50/60Hz, 3-Phase, 3/4-Wire. 1000kW Simplex Mars Load Bank. Capacity: 1000kW. Model: Mars. Cooling: Forced Air. Year: 1998. Fan Power: External 480V. Frequency: 60Hz. Simplex Mars 250kVAR Inductive/ 150kVAR Capactive (240/480, 3 Phase, 60Hz). Simplex 1000kW Resistive Load Bank. Simplex Load Banks. Avtron 1000 kW loadbank 480V No controls AS IS WHERE IS Unit was new 2 years ago for a project that fell through. Never been used. Unit is as shown in pictures. Has fans on the side. RESISTIVE LOAD BANK. THIS IS A WORKING SIMPLEX SWIFT E FT. 10KW, 1.0PF. TDI Power Load Bank. S/N: 0824-0003. Made in 2008. 4000 Watts. K575A Special Sound Attenuated Resistive Load Bank. 350kW, 480VAC, 3PH, 60Hz. Custom Low Noise Enclosure with 2 Year Warranty. 2640kW Resistive/1980kVAR Reactive Load Bank. 10′ ISO Container. Aux: 380-480VAC, 50/60Hz, 3 PH, 3 Wire. Test: 380-480VAC, 50/60Hz, 3PH, 4 Wire. Model: CR3.3MVA. 900kVAR Simplex Load Bank. 900kVAR @ 1.0 P.F. Air Cooled Reactive. Model: Saturn. Cooling: Forced Air. 3 Phase, 3 Wire. 900kVAR Simplex Saturn Load Bank. Capacity: 900kVAR @ 1.0 P.F. SN: 39812-00-43/5. Fan Power: Internal 480VAC. Connection: 3 Phase, 3 Wire. THIS IS A SIMPLEX LOAD BANK 263(603KW) FORCED AIR COOLED RESISTIVE LOAD BANK LBS SERIES 12,500 CFM. THIS IS A SIMPLEX TITAN LOAD BANK FORCED AIRE COOLED RESITIVE/INDUCTIVE LOAD BANK. 208V 10,000 CFM. Crestchic Load Bank. Model: CR6.25. This unit will produce 5000kW of real power dissipation at 480V full load. It is essential the inlet and outlet grilles are free from any obstruction otherwise the loadbank will overheat.